A political party’s ideology guides its economic, social, governance, legal and foreign policies. One of the most vivid methods by which an ideology can be visualised is by the description of an ideal world as envisioned by the adherents of that ideology. For example, if your ideal world is one in which everything is owned by everyone (no privately-held property) and shared according to need, you are a communist. If you prefer a world in which the state owns the means of production, you are a socialist. And if you believe the state should have control over every aspect of human life, you are a statist. Of course, it would be difficult to list all the elements that constitute an ideal world under each ideology. It is also very likely that people who identify with the same ideology could have significantly different ideas of how an ideal world would be like. Also, the terms liberal and conservative nowadays refer to so many different things in different political terrains that using it will not give much meaning. I did write a post on socially liberal politicians in Ghana, but I was clear on their positions on which issues earned them that label. 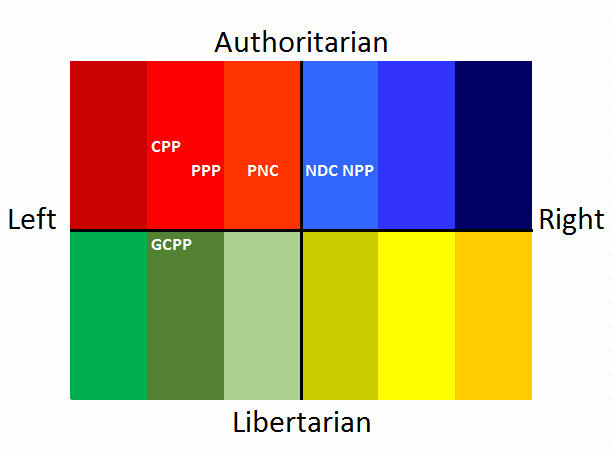 Therefore, the best way to present the ideology of the parties would be through a political compass. 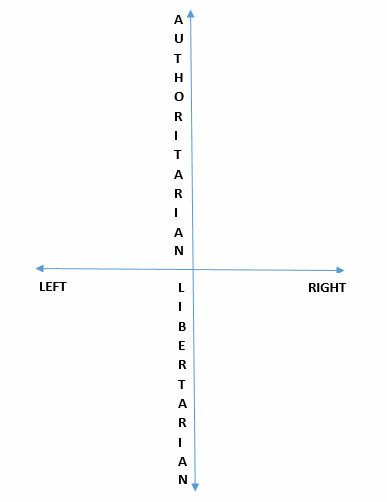 The diagram above shows a rudimentary political compass with four points. The right and left describe economic positions and authoritarian and libertarian describe social positions. Each of the cardinal points is explained below. Authoritarian is used here to mean active state control in the social lives of the citizenry. This includes control over thought, movement, faith, speech, drugs, information, sexual and reproductive rights. The further up the scale a party is, the more authoritarian it is. Libertarian is used here to mean individual liberty. It is the opposite of authoritarian. Libertarian regimes feature the right of individuals to thought, speech, faith, drugs, information, sexual and reproductive rights. The more libertarian a party is, the less it believes the state should control the social lives of the citizenry. Left is used here to refer to active state control in the economics of a country. It ranges from government regulation in markets, state welfare programmes for the disadvantaged, social democracy, state capitalism, socialism and communism as you move further left. Right as used here means the absence of state control in the economic affairs of a country. It ranges from neoliberalism, US neoconservatism, classical economic liberalism and capitalism as you move further to the right. Based on the most recently available policy positions of the political parties and a bit of their traditional ideologies, I present the ideologies of the top 6 political parties ranked according to their performance in the 2012 general elections and subsequent by-elections. Summary: The NDC’s private sector-led development policy, freeze on public employment and divestiture of state assets makes them a moderate right-wing party despite their traditional leftist ideology. They however believe in universal healthcare, a centralised minimum wage and free basic and secondary education. Their position of state interference in drugs, sexual and reproductive rights makes them authoritarian. 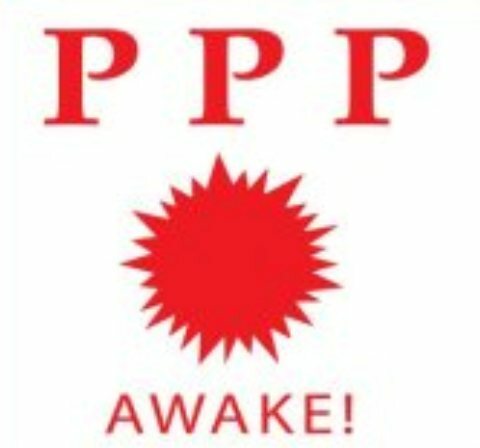 Summary: The NPP believes that the productive activities of the economy are best left in the hands of the private sector. They however believe in universal healthcare and a centralised minimum wage and free basic and secondary education. In fact, their most prominent electoral promise in the 2012 general elections was free secondary education. Like the NDC, their position of state interference in drugs, sexual and reproductive rights makes them authoritarian. Summary: The PPP was formed ahead of the 2012 general elections when Dr Nduom led a break away from the CPP to form the party. Their 2012 political platform described them as “pragmatists” but their belief in a state-led economic, energy and agricultural development, free basic and secondary education and universal healthcare puts them on the left. 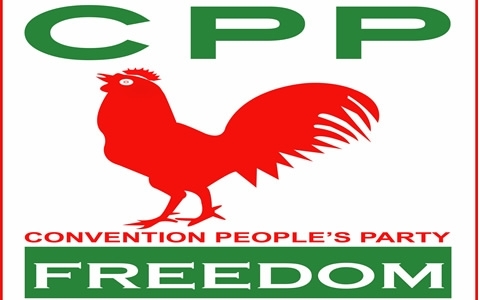 They champion a strong anti-drug policy and although their position on sexual and reproductive rights was not made known, it is assumed they follow the authoritarian position of the CPP. Summary: Although the GCPP’s 2012 political platform described them as “pluralist”, their advocacy for a state-led energy and agricultural policy and self-sufficiency (domestication) puts them on the left. Although the platform was not specific, their commitment to a modern Ghana that is progressive and humanistic puts them a little under the libertarian label. 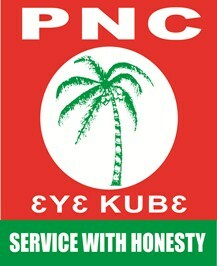 Summary: The PNC’s economic policies as found on their website is not clear on whether they favour a state led or private sector led economic policy. However, their roots in Nkrumaism means that they are likely to be on the left. They believe in equal opportunity but they prefer to improve access to and the quality of education before making secondary school free. Their position on drug liberalisation, sexual and reproductive rights makes them authoritarian. Summary: The CPP is the most consistently leftist party in Ghana. They oppose the sale of state assets, believe in free education, state-led economic development, social justice and panafricanism. Their socially conservative position on drugs, sexual and reproductive rights puts them in the authoritarian category. They score a rung higher on the authoritarian scale because of their vocal opposition to genetically-modified crops. The role which ideology plays in the political choice of the people will be the subject of another post. i don’t understand why NPP and NDC are similarly positioned despite substantial differences in economic policy. In terms of ideology they are opposites but their policies in government have largely been similar.